Although an ordained Baptist minister, he was pastor at the First Presbyterian Church. Park Avenue Baptist morphed into Riverside Church in 1930 with assistance from John D. Rockefeller. Harry Emerson Fosdick is currently considered a "single author." If one or more works are by a distinct, homonymous authors, go ahead and split the author. 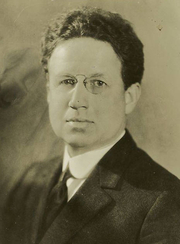 Harry Emerson Fosdick is composed of 17 names. You can examine and separate out names.